Modified polymers that instinctively “plug into” cell membranes, forming a structure that can also be pulled apart without damaging the cells, could lead to new approaches in tissue engineering, according to research published by current and former University of Maryland students and faculty. 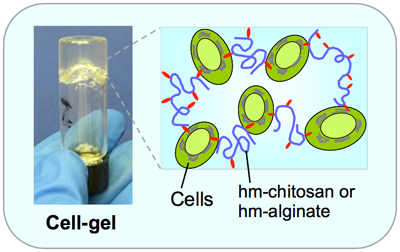 The paper, "Reversible gelation of cells using self-assembling hydrophobically-modified biopolymers: Towards self-assembly of tissue," was published in Biomaterials Science and highlighted on the journal's blog. Raghavan and his co-authors, including ChBE graduate students Vishal Javvaji and Hyuntaek Oh, former group member Matthew Dowling (Ph.D. ’10, bioengineering), and Associate Professor Ian White (Fischell Department of Bioengineering) found that adding modified forms of natural biopolymers such as chitosan and alginate to a liquid suspension of cells transformed it into an elastic gel. The gelling did not occur when unmodified biopolymers were used. The team grafted fatty hydrophobic (naturally repelled by water) “tails” onto the chain-like “backbone” of the bipolymers. In their quest to find a “dry dock,” the tails embed themselves in the cells’ bilayer membranes, whose interiors are also hydrophobic. Since there are multiple hydrophobic tails attached to each bipolymer chain, they are able to bond with additional cells, creating a three-dimensional network in which the cells serve as junctions. The result is a gel that immobilizes the cells, but does not harm them. Multiple hydrophobic “tails” (red) are attached to each polymer backbone (purple). In their efforts to avoid water, the free ends of the tails are attracted “plug into” cell membranes (green), linking the cells and polymer chains together and forming a gel. Adding another material, a soluble barrel-shaped molecule called α-cyclodextrin (alpha-CD), reverses the effect. Alpha-CD is capable of attracting and bonding with the hydrophobes on the bipolymers, but cannot interact with the cells’ hydrophobic membranes. As the gel is exposed to an excess of alpha-CDs with competing bonding sites, the bipolymers detach from the cells and bond with the alpha-CD instead. When the cells are released from their network, the gel reverts to a liquid suspension. The reversal process did not harm the cells either. The results were demonstrated with hydrophobically modified versions of alginate and chitosan, which are biocompatible and already used in biological studies; and with blood, endothelial, and breast cancer cells. Raghavan says this discovery is not necessarily better than current tissue engineering techniques, but presents an alternative approach to explore. He and his co-authors believe the technique could also serve as a platform for applications such as 3-D cell culture, injectable cellular therapies, tissue sealants, and blood clotting.